The team behind Thrust SSC — the world's fastest land vehicle — have been working hard to ready their even faster 1,000+ mph BLOODHOUND SSC. And they have the 3D drawings to prove it'll be the fastest hybrid car ever conceived. Yes, it's a hybrid. But as you can see in the drawings it's a hybrid of three great powerplants: a Eurojet EJ200 jet engine that'll propel the car to 300 mph, a rocket that'll provide enough boost to get it up to 1,050 mph, and finally an F1 Cosworth V8 used to provide auxiliary power and drive one of the rocket's pumps. 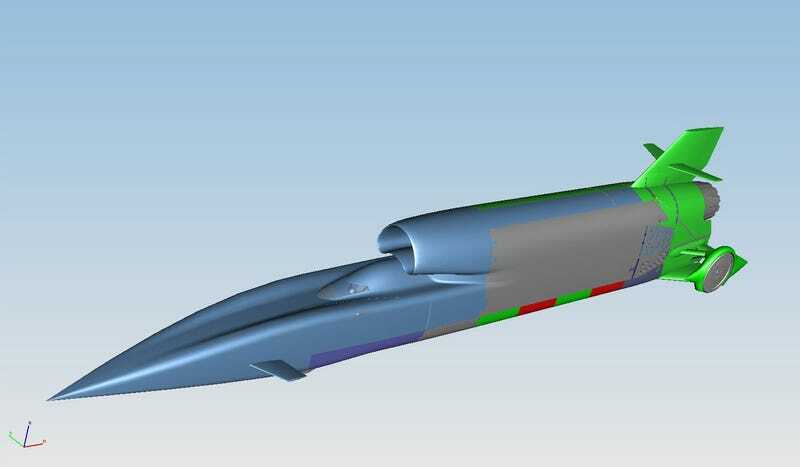 Unlike other competitive series where information is heavily guarded, the BLOODHOUND team's mission of encouraging scientific discovery and expiration led them to release their engineering drawings. Plus, the parts are a little hard to source. "If you had a spare jet, rocket and F1 engine, you could, in theory, use these drawings to build your own BLOODHOUND at home," said chief engineer Mark Chapman. "Much as we enjoy a good race, we don't recommend it. Things get pretty hairy when you travel faster than a bullet!" If everything goes as planned, the BLOODHOUND SSC will hit the ground next year with pilot Andy Green back behind the controls. Of course, we hope it doesn't actually hit the ground as 1,050 mph is kind of fast.